Advantages of Test Equipment Rentals. • Helps to evaluate equipment before purchasing. • Keep projects on schedule. • Saves maintenance cost and much more. As per the growing requirements of our clientele, we are involved in delivering Relay Test Set Rental Services to our honored clientele. These presented services are extremely valued amid our valued customers for their promptness and flexibility. 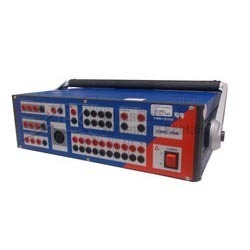 The OMICRON CMC 356: 6 Phase Current / 4 Phase Voltage Protective Relay Test Set is the universal solution for testing all generations and types of protection relays. Its powerful six current sources (three-phase mode: up to 64 A / 860 VA per channel) with a great dynamic range, make the unit capable of testing even high burden electromechanical relays with very high power demands. The CMC 356 is compliant with NERC/FERC protection relay testing standards.